This famous scent, with its sweet yet earthy fragrance, is ideal for creating a relaxing atmosphere and for use while meditating. 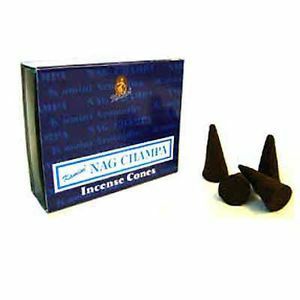 Kamini Nag Champa Cone Incense is made from the finest natural raw materials, dipped in high-quality perfumes to produce beautifully fragranced incense. Each box contains 10 incense cones and 1 small metal cone incense holder. Kamini Aromatics is one of the most popular incense brands throughout Europe and Australia.